Circular Concepts is a family-owned company that manufactures over 125 wheels in various sizes and colors. Our success has allowed us to purchase materials in bulk at the best possible prices so that we can pass competitive pricing along to our customers. 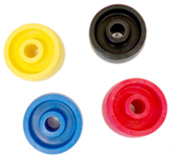 As an industry leader of quality injection molded wheels, our efficient manufacturing operation, superior customer service, stocking programs, JIT, and same-day shipping options allow you to purchase exactly what you require at the exact time you require it. We also offer our customers a choice of products that are 100% post- consumer material. Need something out of the ordinary?CONTACT US TODAY!